Two months and a day ago, I thought I would not be able to love two girls. I love you and your sister, (though trying as both of you maybe) with a love that can not be expressed in words. You have survived the kissing and hugging and patting from Bella. You have survived mommy's melt downs with and with out medication. Mommy is the one that's in need of medication. You have survived another milestone in your small short life. You are teaching me another lesson in slowing down and taking one step at a time and to remember to breath. You are letting me experience the joy of motherhood a second time and seeing life through your brand new eyes. This time I am a bit more relaxed. This time I don't feel the pressure of trying to have the perfect anything and everything. This time I know when you look into my eyes, I know what you are thinking... well some of the time. This time I can do what's right for me and not feel like I am going to hurt you. All I want to do is love and hold you. 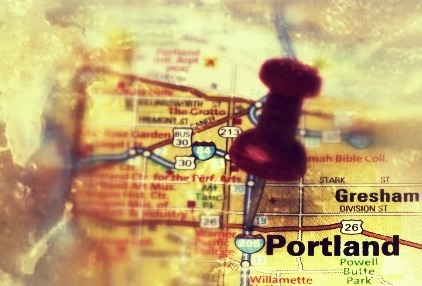 Friday I go on a thousand mile adventure to the great Northwest and back. I am looking forward to the time away from my residence, however I am not looking forward to the mode of transportation that my husband suggested we take. In either the RAV4 or the Cube. Yup traveling by CAR. We get to have a two month old, a two and a half year old in back, while my husband and I rotate the driving towards our destination up north for 11 hrs. 6 hours to the hotel where we spend the night and another 4.5-5 hrs to the final destination. Portland OR. I would prefer a 2 hr flight, rather than listening to my two month old cry for a half an hour on the freeway because we get stuck in traffic. The TSA agent pat down to my toddler ask "what that?" or "we going that way?" six times too many and can't take a pill to lessen the stress because it makes me drowsy and can't drive. The feeling that I am on vacation using some rental car rather than my own knowing the mileage will count against me when the car insurance renews. Maybe I am hyping this up in my head. Then again maybe not. We will see come Friday. I love to follow Mom-businesses on twitter. I don't remember when I started to follow Sew Curly Creations on twitter (@SewCurlyK) but I think it was due to something she said about her three little girls that made me want to follow her. Also being a entrepreneur of hand crafted items I could learn from her as well. One day she posted that she needed some test babies for her new blanket idea she had in December. Since I was due in a week I thought maybe I could help her out. Even if my new born didn't get the chance to test drive the item I would still know I tried and maybe the next time. There were several people that wanted to test the blanket out and Grace and I were chosen. She asked me what the baby's name would be and I stated I didn't know until the birth. She said when the baby was born just let her know and she would work on the blanket. A week later Grace came in this world and I told her when I was able. And started the look out for the blanket. When the blanket got to my house it was nicely wrapped in tissue paper and had a few business cards of hers tucked inside. I inspected the embroidery and it was nicely done. It didn't have the huge sheet of backing that I find in other embroidered items and I really dislike because I have to throw the excess away because it falls off in the wash and gets other clothes dirty. The blanket edging is nicely done. Instead of the pointed edging, its squared and is a little heavier than the blanket, which is nice because it gives it a little weight so it won't blow away. There are a few rough spots, however it shows that it was hand made and not done in a factory. The material for the blanket is a soft pile that is cushy, the only draw back to it is that it does cover the nice work of the embroidered name. If it was done on the shorter side of the fabric, I think the name would stand out more. However the name is still visible and in very nice script. When my Mother-in-law saw it she said it was very beautiful asked me where I got it, and at the same time my daughter who is two and a half asked where her blanket was and proceeded to get a possessive of the blanket until I explained that this was Grace's special blanket and she had her own. In the weeks following the arrival, it has been washed several times because of the regular happenings of the baby and has been dropped on the ground by accident as well. My major fear in the beginning was washing it and the color of the blanket bleed into the white of the words. As one wash led to two, not only did the letters stay white, the rest of the wash (I don't separate my whites from my brights) stayed their same color as well. I am very happy with the quality and how it keeps my daughter warm. I wish this would have been a colder winter as she does run a little warm during the days, however it does help at night when we are coming back in the cold and the few blankets we have are a bit too warm for her right now. And just recently I took it to Grace's first Yoga class and used the blanket and a couple of moms said that they liked the blanket and wanted to know where it came from. My rating would be 3.5 out of 4 stars - As I stated there are a few things that are small like the one end of the blanket and the nice embroidery covered by the material. As this is a test run to see how things are in the real world for her design and it keeps my daughter warm, I can honestly say I think this blanket is going to be with us for a very long time as Grace's comfort blanket. My cat kneading the blanket. He stayed and slept on it next to Grace. Please note: I was not paid for this review nor the rating I gave. I did get the blanket for free and was not told to write a review in exchange. I am on maternity leave and have really nothing to do till I go back to work. Ok, be a Stay At Home Mom for a little bit, go to MD appointments for me and Grace, and of course be home to welcome Bella home from day care. Besides that I have nothing to do with Grace. The studio is by the Lucas Arts Studio in the Presidio by the Lombard gates. The studio itself is very nice, hardwood in the studios and the latest equipment (from what I saw). The instructor was very nice at the door as I walked in. She was very kind and told me where I could get mats and blankets. There are mats and extra blankets there so if you're like me and don't have a mat and they have plenty to spare. Because it was a GGMG day the instructor said there were more moms than usual so it made me want to come back to see what it was like in a typical class. The instructor, when the class began, told us that the class was very flexible to the baby's needs and if we needed to feed, change a diaper or leave because the baby was over loaded that was totally fine. Grace wasn't very fussy as some of the baby's there but wanted to be fed and was overloaded with new movements a few times. She liked looking at the baby next to her, a cute chubby 6 month old and something called "Roll-ly Poll-ly" where you hold both hands and feet with your hands and roll the baby side to side from ear to ear and the Dino walk (modified because there were so many moms), her in my arms, with my legs spread out shoulder with a part and bent. Then rock slowly to one side pointing that toe and very slowly going back to the bend and rocking to the other side and repeat on the other side. She didn't like (right now) anything to do with movements of her limbs. The instuctor said that it might happen as being almost two months Grace might not be fully aware of the limbs yet, so we are going to practice at home. We also did some baby massage as well. Grace didn't mind the massage of the legs, and again it was a little short because of the size of the group. however it was a good experience for Grace and I and like I said before I am going to go when its a "normal class" to see what the difference is.